Check out Trolley’s latest design in Home Concepts May 2009. Our TeTris Rack in Blue and White are featured on the cover of Home Concepts. Also available in black & pink. The Tetris Racks are brilliant space-saving display racks that hold any CD and journals. Designed locally by our Trolley designer, the rack are reminiscent of our childhood classic block games before the invasion of computer, x-box, playstation and nintendo. The width fits and holds a CD perfectly without any extra space while the “taller block” hold DVDs. If you are also looking for a rack for books and journals, the Tetris Rack holds up to 40-50 books. 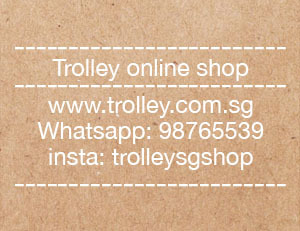 Available in White, Black ,Blue & Pink at TROLLEY, Singapore. Do you still have the tetris rack? Yes we still have Tetris Rack in Black, Blue and Pink. is the tetras rack still available? What is the material of these racks and can you let me know the dimension of a rack? Can they be wall mounted? Hi, Neat post. There’s a problem together with your website in web explorer, could check this? IE nonetheless is the marketplace leader and a big part of folks will leave out your excellent writing because of this problem.